Supreme Court has quashed criminal proceedings against a person who tried to smuggle mobile phone to Central Jail, Ferozepur. The accused had gone as a visitor to the Central Jail, Ferozepur on 17-09-2009 and a mobile phone and a charger were recovered from him on search. An FIR dated 24.09.2009 was filed at the Police Station Ferozepur, under Sections 42 and 45 (12) of the Prisons Act, 1894. Accused contended that the offence under Sections 42 and 45 of the Act is not made out, and that mobile phone and charger are not included in the list of the prohibited articles. He also contended that section 52-A, which prohibited the carrying of a mobile phone, has not been notified at the time of the commission. Accused has approached High Court of Punjab and Haryana to quash the FIR filed against him but not succeeded and later he approached Supreme Court. Bench comprising of Justice Sudhansu Jyoti Mukhopadhaya and Justice V Gopala Gowda held that there is no offence made out against the appellant. Court opined that the accused shall not be made liable to an offence under section 42 of Prisons Act 1894. Notification of Section 52-A was dated 08.03.2011. The offence alleged is committed on 2009, and thus, this notification will not apply to the case as the same is prospective in nature. Retrospective effect will not apply in the case of criminal laws. Hence, there is no offence made out against the appellant, Court said. Smuggling of mobile phones into the prison has become rampant regardless of high profiled security systems installed there. While a few of inmates use the phones to communicate with friends and family, there are cases of prisoners using the devices to facilitate crimes and harass crime victims and witnesses. Kerala Police on Thursday arrested four persons in a case related to the use of mobile phones and Facebook in the jail. Live Law has carried a detailed story regarding the prisoner’s right to communication inside the prison in the light of the incident. 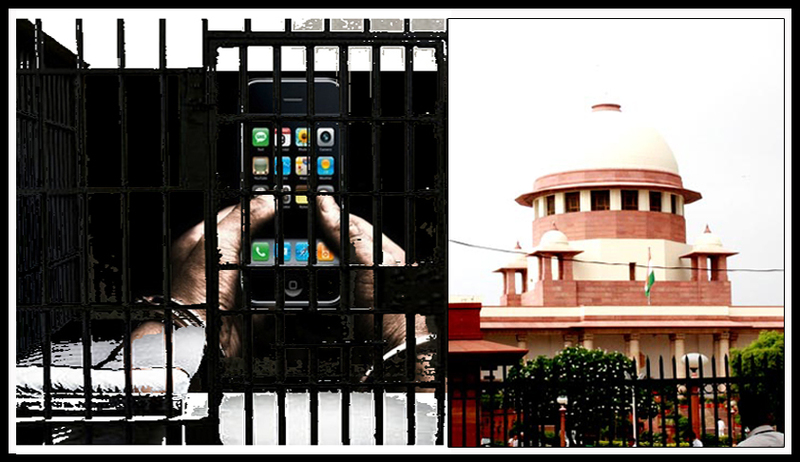 In 2010 High Court of Delhi by its own motion initiated a writ proceeding against the state to bring an end to the shocking state of affairs which pertain to the use of the cell phones in Tihar Jail despite the jammers and CCTV cameras having been installed in the said jail. Deccan Herald has reported that mobile phones are increasingly being smuggled into Tihar Jail by the criminals to run their illegal activities from inside the jail. TOI had also reported a similar incident which a surprise raid at Trichy central prison has showed that smuggling of mobile phones inside the prison is still rampant.